Enter your dates to pick from 32 hotels and other places to stay! Featuring an outdoor swimming pool, Millenium Suites is located in Conakry, 3.2 miles from Taouya market. Featuring a fitness center, the 4-star hotel has air-conditioned rooms with free WiFi. Spacious rooms with comfortable bedding, fitted kitchenette and living room area. Excellent quality of prestation for price. Nothing to complain about! Will stay there again. Set 1.9 mi from Taouya market, Sheraton Grand Conakry offers 5-star accommodations in Conakry and features an outdoor swimming pool, a fitness center and a bar. Very nice hotel and very good amenities. However, breakfast selection was too limited, e.g. lack of corn flakes or raising brand cereals, but still friendly waitresses and waiters though. Offering an outdoor pool, ONOMO Hotel Conakry is set in Conakry. Guests can enjoy the on-site restaurant. Free WiFi is available throughout the property and free private parking is available on site. Great location and beautiful new facilities, good food. The Onomo Conackry is the best of the 3 Onomo Hotels at which I've stayed, the others also good to very good in Abidjan and Dakar. Located a 14-minute walk from Fishing Port (Boats to islands), Primus Hotel Kaloum offers 5-star accommodations in Conakry and has an outdoor swimming pool, a fitness center and barbecue facilities. Located 2.4 miles from US Embassy, CITY HOTEL in Kipé has a garden and terrace. Featuring a 24-hour front desk, this property also provides guests with a restaurant. Rooms contain a balcony. Located in Dixinn, Hotel Palladium city has free bikes and terrace. All rooms have a kitchen and a private bathroom. Guests can enjoy a selection of European dishes in the in-house restaurant. Located 1.5 miles from Taouya market, Hotel Star Africa has rooms with air conditioning in Conakry. The property has a garden, as well as a terrace. The property provides a 24-hour front desk. L'Almamya Hotel Residence in Conakry features 2-star accommodations with a shared lounge. This property is located a short distance from attractions such as Fishing Port (Boats to islands). Grand Hotel Central offers accommodations in Conakry. Guests can enjoy the on-site restaurant. Rooms are fitted with a flat-screen TV with satellite channels. The Resturant and the lounge up the roof. The hotel is close to everything you might need during your stay and you can reach them by walking. Offering a sun terrace and fitness center, Hotel M'LYS is located in Conakry. Guests can enjoy the on-site restaurant. The room looked nice and right next to it was a nice club. Offering a barbecue and views of the pool, Le Petit Chalet Hotel is located in Conakry. Guests can enjoy the on-site bar. Rooms include a flat-screen TV with satellite channels. Conakry is expensive so value for money budget place. Good wifi. 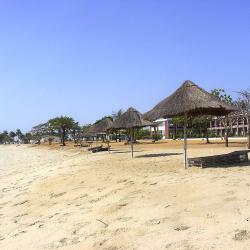 Golden Plazza offers accommodations in Conakry. Guests can enjoy the on-site restaurant. Free WiFi is available throughout the property and free private parking is available on site. The hotel is clean, staffs are friendly and reliable. Located in center city with a peace of mind security. Worth the money, you cant beat it. Offering an outdoor pool and a spa with wellness center, Riviera Royal Hotel is located in Conakry. Free Wi-Fi access is available. I did not leave the hotel that night. Had everything I needed. A restaurant, a casino, a lounge area next to a pool, and a nightclub with free entry for hotel guess. Offering outdoor pool and a restaurant, Riviera Taouyah Hotel is located in Conakry. Free Wi-Fi access is available. Private bathrooms also come with a shower. Extras include a desk. Staff are great. Never see any management though. Have the impression the staff are just left to make the best of it. Restaurant is mediocre. Wifi is decent. Located 6 miles from Taouya market, Le Beau Village provides accommodations with an outdoor swimming pool, free WiFi, a shared kitchen, and a shared lounge. The hotel was great the staff in the restaurant. All brilliant and so nice and so helpful. Aisha, Marie and my good friend I met I can’t remember her name the tallest amount the 3 girls. I think is Gulie I don’t know. I think she is family member of the land lady. And the security guards are so helpful and friendly also the pool cleaner and the rooms cleaner. The location of the hotel so perfect not far from the airport and cash mashine at the bank next to the hotel which is so helpful to customer with Visa cards or credit cards. The hotel also accept Visa cards so good. The two owners are both fantastic and so respectful to the clients. I felt home. They even invited me to share their food with their friends at lunch time which was remarkable. Thank you village hotel. Featuring a garden, Villa Madiana is located in Conakry, within a 2-minute walk of Taouya market. All units feature air conditioning and a flat-screen TV. Joane was so helpful initially in giving directions and tips for my taxi ride but went over and above to help me find information on transport out of town, it made a huge difference to me. Cheerful, helpful and the place is run professionally. I would definitely stay again. Located within 2.5 miles of US Embassy in Kipé, Pension Les Palmiers provides accommodations with a flat-screen TV. Free WiFi is available. Some units have a terrace and/or balcony. This family run inn is one of the friendliest places I’ve ever been. You’ll meet three generations of the same family here, beginning with Isabelle, a lovely lady who comes out to greet and chat with her guests every day. Her son Ismael, who oversees operations, not only picked me up at the airport but drove me around to help me get a visa for Liberia. Thanks to him, I got a complete narrated tour of Conakry! The pension itself is a perfect setting to just chill out and enjoy the lush garden and the beach out back. Breakfast and dinner are served family style, so it’s a good way to meet other travelers and guests. The fish I had every night for dinner is very fresh and delicious. Breakfasts were great. My ocean view room was really big with a comfortable bed and loads of hot water. I’m very glad I stayed here. 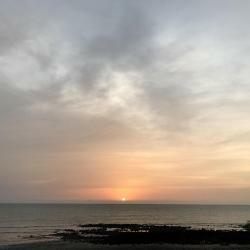 Residence Sandervalia provides accommodations located in Conakry, a 13-minute walk from Fishing Port (Boats to islands) and 8 miles from Taouya market. Complimentary WiFi is offered. Central location, value for money, excellent breakfast,, airport transportation included, keep up the good work !